Our Welburn family was established on October 4, 1832 when our great-great-great-grandparents applied for a marriage bond in Sussex County, Delaware. MARY A. GRAY-WELBURN (pictured on the right) is our matriarch. She was born circa 1815 in Sussex County, Delaware. Her father LONDON GRAY is listed as head of a "free colored" household in the 1810, 1820 & 1830 Censuses and appears in the tax records of Baltimore Hundred as early as 1803. Prior to this London Gray may have been counted among the household of Thomas Gray. Because of her physical appearance, the ethnicity of Mary Gray Welburn had been in question. DNA testing for her direct maternal ancestry in 2006 revealed an Eastern Mediterranean heritage, with an exact match to the Druze people of Palestine. GEORGE W. WELBURN is our patriarch. He was born circa 1806 in Accomack County, VA, just 2 counties to the south. In all likelihood he was probably born a slave, but no manumission record for George has been discovered and he may have "strolled away" from or been illegally released by his owner. Just prior to marriage he resided in Maryland (presumably Worcester County). He appears by name in the Federal Censuses of Sussex County, Delaware for 1840, 1850, 1870 & 1880. He is also listed in the Sussex County tax records beginning in 1835. Through DNA testing in the spring of 2008 it was discovered that George Welburn's direct paternal ancestry matches the Balanta people of Guinea-Bissau. 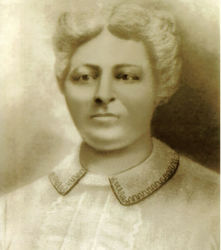 The woman we believe to be his mother, HANNAH WELBOURNE (born circa 1791), was a slave of Reverend Drummond Welbourne, a Methodist minister in Horntown, Accomack County, Virginia. Hannah's manumission was written in June 1818, but despite Virginia state law requiring freed slaves to leave the state, Hannah remained in Accomack County. It is the strong opinion of some that Hannah was the child of Rev. Drummond Welbourne. This is supported by recent DNA testing which established a link between us and the ancestors of the Rev. Drummond Welbourne. According to the 1880 Agricultural Census, George & Mary Gray Welburn owned a 30-acre farm, valued at $800 in 1880, which along with livestock produced eggs, indian corn, "irish" & sweet potatoes, butter, and molasses. However, tax records indicate that the Welburn farm was actually 46 acres. According to R.P. Fletcher, a Special Examiner of Military Pensions, the Welburns "belonged to a set of colored people, some 15 to 18 families, who have for many years resided in Baltimore Hundred (district or township) Sussex County, Delaware-- free born and not like the usual colored communities segregated, but living among and with the whites in nearly equal terms. As a result during the twelve or more years I have known these people I have found them frank and direct in their speech, showing none of the secretiveness and antagonism the colored people so often exhibit when dealing with the whites." This is just a small part of our family's story.